In brief: The general consensus following a brief hands-on period is that the Galaxy Fold feels like more of a polished product and less of a concept or first-gen device than you'd expect. It's far from perfect, however, as there is a crease that you can both feel and see at extreme angles, the front (outer) screen is comically small, the notch on the inside is large and the near $2,000 price tag is tough to swallow. Still, overall sentiment is positive and that's good news for Samsung and the foldable category as a whole. Samsung’s first foldable smartphone, the aptly named Galaxy Fold, launches on April 26 following months of teasing and hype. 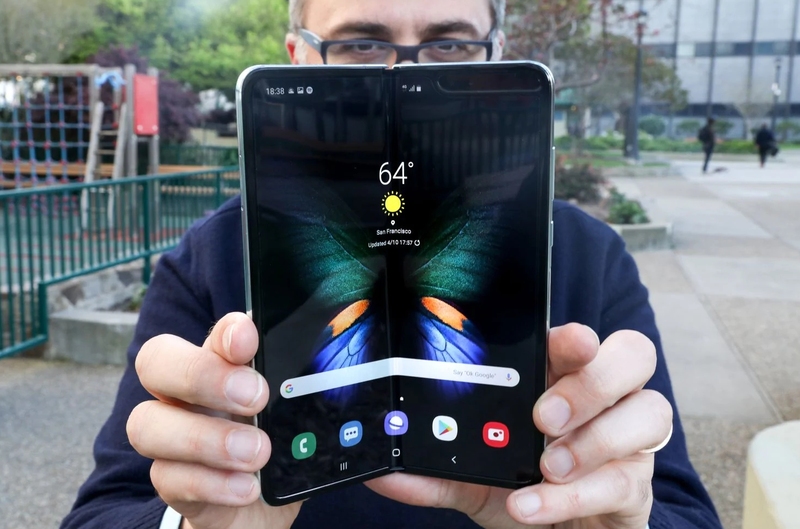 Up to this point, virtually everything we’ve seen and heard about the Fold has been dictated by Samsung as nobody outside the company’s walls has had an opportunity to play with the device (or been authorized to speak on it publicly). That all changed this weekend, however, as Samsung invited select journalists to a hands-on session with the Fold. Here’s what they’re saying following the embargo lift earlier this morning. When it’s closed, the Galaxy Fold looks like two elongated phones pressed together, attached by a hinge on one side. It’s made of aluminum, and the front and back of the phone—how to best describe a phone that is a single phone but has separate physical elements—are constructed of Gorilla Glass. I managed to squeeze the folded-up Fold into the side pocket of one of my most fitted jackets, but it’s inelegant in this state. You can hold it in one hand, sure, but it feels like carrying a TV remote. The display on the face of the phone has a 4.6-inch diagonal, and occupies a relatively small portion of the available space. During the brief time I used it, I tapped the bottom of the phone many times when it was closed, expecting a virtual home button to be there. But it’s much higher up on the face of the phone, because of where the touchscreen display starts. There is a learning curve with the Fold. The larger, tablet display features an advanced composite polymer layer, which is stuck to the body with a foldable adhesive, allowing the display to bend, flex and stay on the device. It's also the thinnest display Samsung has ever made. When folded out, you're greeted by a 7.3-inch, QHD+ Super AMOLED display with is bright, clear and crisp with plenty of color fired directly into your eyes. It also supports HDR10+, providing an enhanced viewing experience with supported video. Looking at the display at an angle, and there's a noticeable crease running down the entire length of the screen in the middle, where it folds. It's not something that came be remedied, and you'll have to accept the fact it's there if you do opt to splash the cash on the Galaxy Fold. There is no headphone jack, though Samsung does include a pair of its wireless $129 Galaxy Buds in the box. While there is a 5G model in the works for the U.S. market (and one will be sold overseas) the version of the Fold launching next week in the States will only work on AT&T and T-Mobile's 4G LTE networks. There is also no unlocked model in the U.S. for use on Verizon or Sprint. It’s going to take more time to understand whether the Fold is the future or just a Frankenphone. A smartphone and tablet in one could be convenient ... or do both jobs less well. I suspect it has more potential as a replacement for a tablet than as a phone. To find out, I would need to operate the Fold one-handed on my morning commute, try to burn through emails at a coffee shop, and catch up on my Netflix queue on a flight.